What do you call your part of Capitol Hill? The Slog questioned its neighborhood existence yesterday asking a good question for anybody interested in local identity in a growing urban environment — what should I call my neighborhood? The names we know now for specific areas of Seattle can be too general — both for everyday utility and for more hight falutin’ matters of culture and individuality. The Slog post asked for suggestions on what to call the neighborhood between Union and Madison — the orange triangle below that we’ve called the CD Triangle on this map. On the Capitol Hill side of things, we could easily ask the same questions. Capitol Hill, like the Central District, encompasses several areas with unique, individual demographic and structural characteristics. The part of the Hill we live in shares very little common culture with the western, downtown-side of the Hill. Our meanest friends from that area say we live in Montlake. So mean! Already, the Miller Park area has emphasized its indivuality — we’ve marked the area they intend to represent on the map in rose. Other areas have softer, less-defined identities. 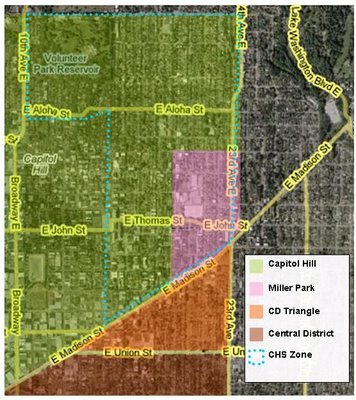 North Capitol Hill is how some refer to the area we call the “fancy pants” part around Volunteer Park. We’ve also heard East Capitol Hill from time to time. We haven’t yet labelled the map with all Capitol Hill sub-hoods but we did mark the (loose!) borders of this site’s focus — look for the blue dots. We need to think a little bit about some kind of framework for what a neighborhood has to include to truly be a neighborhood before we start handing out labels. In the meantime, feel free to leave your suggestions — including leaving well enough alone and sticking with the Capitol Hill confederation. This would be a cool project for Wikimapia. Much more creative than what the city clerk calls my hood. Apparently, I live in the Stevens neighborhood of Capitol Hill. Huh. And all this time, I thought that that CHS was covering Capitol Hill. Now I find that I live too close to Broadway for ya. Huh redux. Oh, pooh, joshua. We said the borders are loose. Art needs limits! yes, i’m in the chs zone! but there should be some infusion of the wealthy + hippie that my neighbors represent. And so… the ever-creeping Capitolism continues to engulf First Hill, which was — at least — everything south of Union that’s not part of the CD. I figure a good rule of thumb is this: If you’re east of I-5, north of I-90, on the ridge, and within 4 blocks of a major health or four-year educational instution, then you’re on First Hill. 15th Ave East could be ‘Health Row”, with Rainbow Natural Groceries, Remedy Teas, & Group Health.